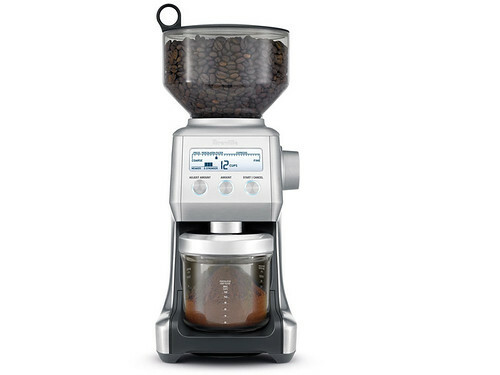 The Breville Smart Grinder™ — the coffee grinder that adjusts the dose when you change the grind. A. Breville Assist™ Lid. B. Bean Hopper Lid. C. 1lb. Bean Hopper - with locking system for easy removal, storage and transfer of beans. D. Upper Conical Burr (removable). 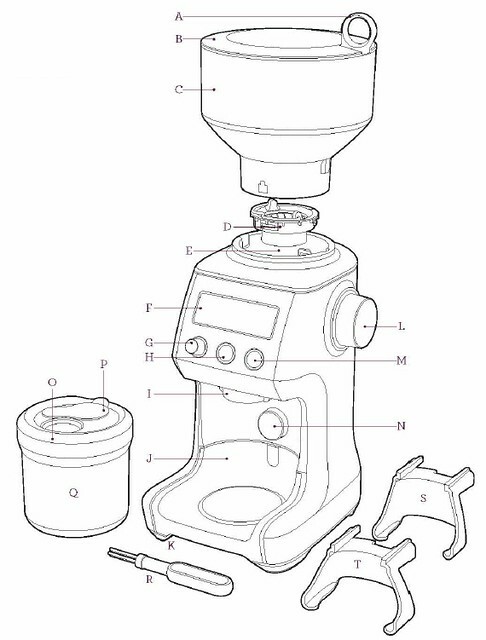 E. Lower Conical Burr F. Backlit LCD Screen - displays the grind setting, number of cups or shots, and customized grind amount. G. 'ADJUST AMOUNT' Dial - Adjust the preset grind amount with less or more grinds. H. 'AMOUNT' Button - On the Espresso setting, choose the number of shots. On the French Press, Percolator, and Drip Filter settings, choose the number of cups. I. Grind Outlet. J. Grinds Catcher - catch grind overspill for easy clean up. Removable for easy cleaning. K. Cord Wrap. L. Grind Size Dial - 25 grind settings from the finest espresso to the coarsest French Press grind. M. START/CANCEL Button. N. Portafilter Activation Switch - for hands free grinding. O. Grinds Container Lid. P. Grinds Container Sealing Cap. Q. Grinds Container. R. Conical Burr Cleaning Brush. S. Portafilter Cradle - Small - 50 - 54mm diameter portafilter compatible. T. Portafilter Cradle - Large - 58mm diameter portafilter compatible.